SAN RAMON, California, U.S., May 31 2012 (IPS) - More than 100 people gathered Wednesday outside the gates of Chevron’s sprawling headquarters in upscale San Ramon in the San Francisco Bay area of California, where police and security barred those without passes to the shareholder meeting from entering. Participants came from traditional environmental justice organisations such as Amazon Watch and Rainforest Action; their numbers were bolstered by the 99 Percent Power group, a several-months-old coalition that links the Occupy Movement with the fight against corporate greed and targets shareholders meetings. Inside Chevron headquarters, a more sedate crowd applauded Chevron’s CEO/Chairman of the Board John Watson, who touted last year’s record corporate earnings of 26.9 billion dollars, the company’s improving safety record and Chevron’s efforts to enhance communities they work in. “Abundant affordable energy raises living standards,” Watson said. While some came to cheer Chevron’s progress, a number of shareholders and their proxies brought questions and criticisms focused particularly on the environmental degradation they say Chevron causes in its exploration for and extraction of gas and oil around the globe. In particular, concern was expressed over contamination of parts of the Ecuadorean rain forest by Texaco, Chevron’s predecessor, and a subsequent 18-billion-dollar judgment against Chevron. In January, an Ecuadorean appeals court upheld the judgment. Watson, however, told shareholders that the court decision is “an example of a fraud being perpetrated on our company”. He said, in fact, the environmental damage in question was caused by the government-owned oil company Petroecuador, which is spending 70 million dollars to remediate “the consequences of their actions”. Chevron will not pay the judgment, he said. One group of shareholders took on the Ecuador question by calling for better board oversight. They made a formal proposal to improve management by separating the functions of chief executive officer and chairman of the board. “Mr. John Watson is his own boss,” said Simon Billenness, speaking to shareholders in favour of the proposal on behalf of the Universal Universalist Association. Billenness criticised a board decision to approve a 75 percent raise for Chevron’s General Counsel, which they said was based on an assessment of “outstanding management” of the case in Ecuador. “What is ‘outstanding’ about the case is that the Ecuadorian courts have upheld an unprecedented 18-billion-dollar judgment against the company,” Billenness said, adding that plaintiffs plan to pursue Chevron’s assets in various countries outside Ecuador. Separating the functions of the CEO and board chair would promote more independent oversight, Billenness said, noting that while the proposal lost, it did get 38 percent, up from 14 percent when the shareholders voted on the same question in 2008. Other proposals impacting safety and the environment also failed. One would have reserved one board slot for an environmental expert; another called for better accountability around safety issues; and a third proposed preparation of a report to investors on the risks associated with hydraulic fracturing, a controversial process of extracting oil or gas from shale rock that involves shooting water, sand and chemicals down a well. The shareholder question period got testy. First to line up at the microphones were two Watson supporters. Susan Rutherford followed by thanking the corporation “for fighting the shakedown in Ecuador”. Most of the speakers who followed travelled to San Ramon from the areas they said were contaminated by Chevron. Luz Cusangua, who is from the damaged region in Ecuador, called on Chevron to take responsibility. “Our children are deformed, while you are celebrating profits,” she said, speaking through a translator. Emem Okon of the Kebetkache Women Development & Resource Center in Nigeria told shareholders about a fire at a Chevron oil installation that burned for 46 days, contaminating the area and destroying the people’s livelihoods. Cristóvão Luemba from Angola said, “Chevron’s policies in Cabinda are endangering our communities, particularly the fisheries.” He charged Chevron with daily unreported oil spills. “When are you going to start acting right and stop thinking about your profits?” he asked. Henry Clark of the West County Toxics Coalition described problems stemming from the Chevron refinery in Richmond, California, some 35 miles from San Ramon. He talked about the “block toxic smoke” that lasted a week during a recent flare-up at the refinery, and asked the board not to further burden the already overburdened people of Richmond with increased emissions from a new facility being planned. The Richmond refinery is the largest single stationary source of greenhouse gases in California, according to Antonia Juhasz, writing in the “True Cost of Chevron“, an alternative annual report on Chevron. Watson responded to each speaker. In Nigeria, Chevron addresses community needs through job creation and microlending programs, he said, and in Angola, the company takes responsibility for the spills that are Chevron’s. “We have a policy to report every spill,” he said, arguing however that most of the spills are not Chevron’s. He talked about jobs programmes in Richmond and said that city has “some of the cleanest air in the Bay Area”. In his place, Antonia Juhasz of the True Cost of Chevron coalition told shareholders about a spill in Brazil for which Chevron will be asked to pay around 22 billion dollars. Watson took responsibility, to a degree. “We regret the 2,400 barrel spill,” he said, explaining that, working closely with the Brazilian government, they were able to stop the spill within four days. 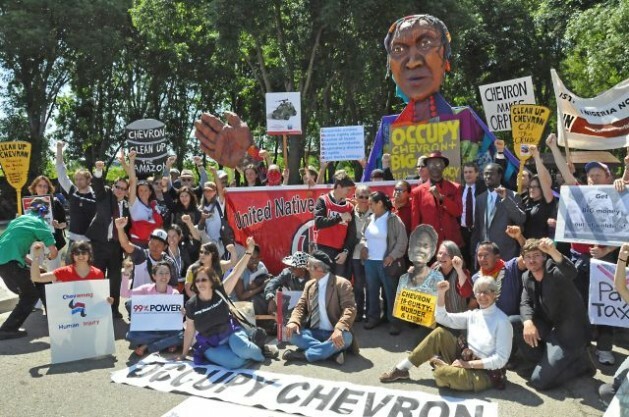 Unable to enter the meeting, Moraes addressed the activists on the sidewalk outside Chevron headquarters.